We were meant to visit both the Roman town of Jerash, and Wadi Rum (of T. E. Lawrence fame) during our stay in Jordan but, so powerful is the romance and attraction of Petra, we end up spending the entire week in its magnetic pull. There is something about this ancient city that compels you to linger and to wax lyrical in the most alarming way. Many a travel has felt driven to use the most florid descriptions of Petra, the most famous observation probably being that of Dean Burgon: 'The rose-red city, half as old as time'. One reason for our devotion might be our long drawn out journey to get here. 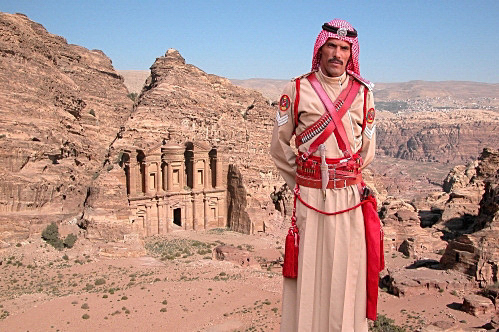 Sensible souls journey to Petra, Jordan's fabled 'secret city', by flying to Amman. Not us. We choose to fly from London on a charter that takes us on the long and scenic route and includes a six-hour delay at Gatwick. Never mind when we finally do arrive the waters of the Gulf of Aqaba are warm and languid - a far cry from the wintery London we have left behind - and the coral strands perfect for snorkelling. Best of all, the Sinai desert by moonlight is a magical sight, with its endless sands and towering labyrinths of pink sandstone laced with black and green granite. The next morning feeling almost human again we set off up the Gulf of Aqaba by ferry. Two falconers from Saudi, sit opposite us in red-and-white checked keffiyehs with their desert falcons perched on gauntlet gloves looking seriously splendid. The romance of the gulf is definitely getting to us. Our ridiculously drawn-out journey fades into a mere travel tale with the first sight of Petra. It is an awesome place and far from being compelled towards flowery descriptions I am at a loss for words. I fall back on Burgon, 'rose red city' , I whisper in homage. My guidebook dismisses Burgon's words as being 'A lovely piece of nonsense summing up with suitable drama the spectral presence of a decaying monument in sandstone desert on the edge of Wadi Araba', but I know exactly what he meant. From the moment one sees the famous Treasury Building, glimpsed through the chasms of the narrow entrance (the Siq), one is overwhelmed by the sheer romance of Petra. Settlements were known in the area as long ago as 7000BC, but Petra as we see it today belongs to the Nabataeans from Arabia who arrived around 600BC. Imposing tough tolls on passing trade caravans, they did very well indeed. So well, in fact, that other tribes tried to cash in on their wealth and Petra became the site of many an ancient battle, including various forays by the Romans, who had been originally bought off. Later, however, the Romans, through a long series of manoeuvres under the guiding hand of King Herod, managed to subdue the Nabataeans before being eclipsed themselves by Palmyra. They, in turn, were defeated by the 7th-century Moslem invaders, who had little time for life in Petra, and so this extraordinary city was abandoned by all except the Bedouins. Rediscovered in 1812 by an intrepid Swiss explorer, Johann Burckhardt, Petra is now a fixed star in any modern traveller's constellation. It lies concealed within the heart of its own hills, wonderfully protected from the gaze of the outside world by the Siq, a mile-long (two kilometres) narrow passage walled by cliffs so tall they almost close over your head. Until recently you could ride through the Siq to the city, but no longer. It seems that the horse boys on their spirited charges tended to gallop a lot, causing many accidents, and scaring the wits out of the tourists, so now one has to walk the chasm. However, in the late afternoons, carriages are permitted to go down to Petra to shuttle home the weary walkers who've spent the day amid its splendours (You can still take a horse from the gates of Petra to the Siq entrance). As you emerge from the shadowy Siq, you find yourself face to face with the Khasne, or Treasury Building. Recognise it from Indiana Jones and The Last Crusade? It's a happy combination of Roman and Nabatean architecture, immensely tall, with carved embellishments of birds, urns and pillars, and originally built as a tomb. Petra is really two cities in one - the city on the valley base, where all the trading and commerce took place, and the tombs, or city of the dead. Just beyond is a 3000-seat theatre, built in the second century, where the acoustics are perfect. I can guarantee this, as my mutterings about how nice it would be to have a cup of tea were overhead by a young Bedouin nearly 1000 feet (a few hundred metres) away. He rushed off, only to return quite soon with a small flask of traditional Bedouin coffee - very thick, and flavoured with cardamom. It was so refreshing, I wasn't surprised to learn that Moses had a good word to say about it as he passed through, trying to secure water for his people after the flight from Egypt. Just beyond the theatre we come to the main city, with its many carved tombs, colonnaded streets and looming gateway. Further on is a good museum that lets you make some sense out of the muddle of facts bestowed upon you by garrulous guides. It also has good toilets. Energetic travellers will want to climb up to the monastery - a steep hike up steps that took us about two hours. (The more languid can take a little donkey instead of shanks's pony. The donkey will deposit you within about 650 feet (200 metres) from the summit of the mountain, where the view is mind-blowing.) You can visit the High Place of Sacrifice, which also requires good walking boots and a reasonable level of fitness. Many of the Bedouins, whose families have lived in the ancient tombs for aeons, scorn their smart new village where the Jordanian Government has tried to resettle them, choosing to live in the dark traditional burial places of Petra. If you too want to stay close to Petra The Luxury Travel Bible suggests Movenpick Resort Petra ,right at the entrance to the historic ruins. A fairly mains stream five star but its location wins out. Further out in the country side the chain also has the Mövenpick Nabatean Castle Hotel. For a more authentic stay try the Sofitel Taybet Zaman Hotel and Resort, around five miles (9 kilometres) away. The hotel's rooms are converted out of traditional Bedouin village houses, linked by narrow walled laneway scattered with courtyards.